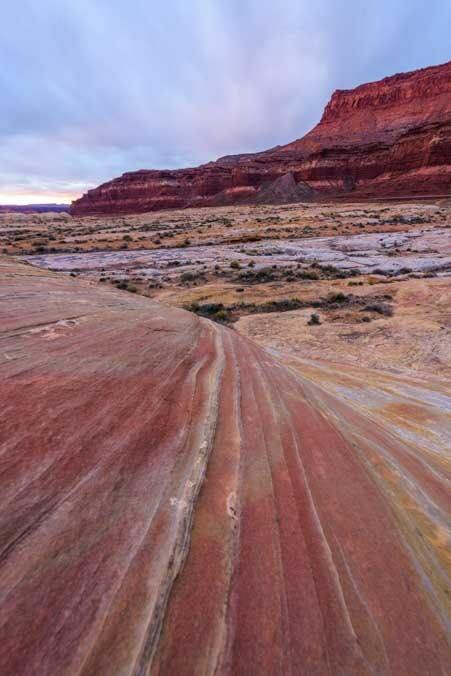 March 2019 – The Utah red rocks are full of whimsical formations that are easily recognizable. 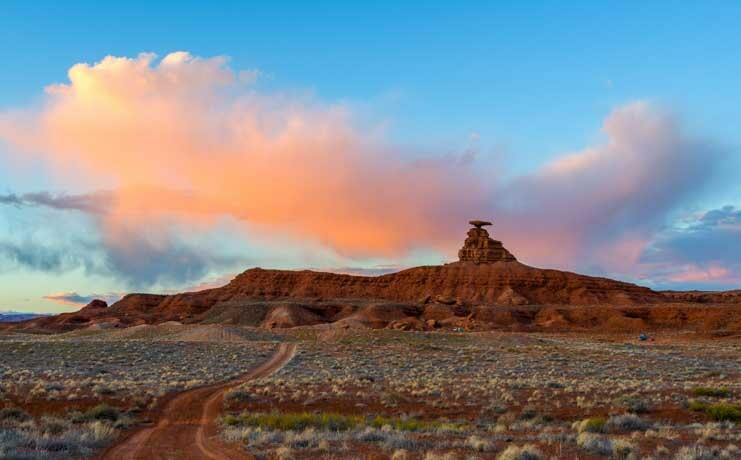 One of the most charming is Mexican Hat, a rock formation that unmistakeably resembles a sombrero. 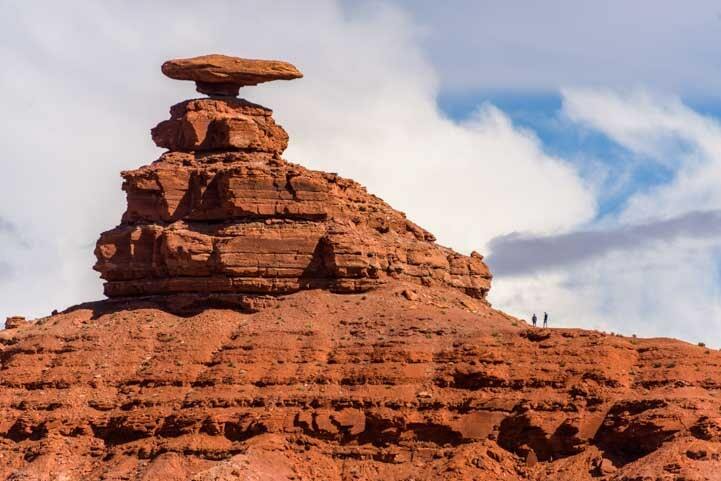 A Mexican sombrero caps off the landscape in Utah. 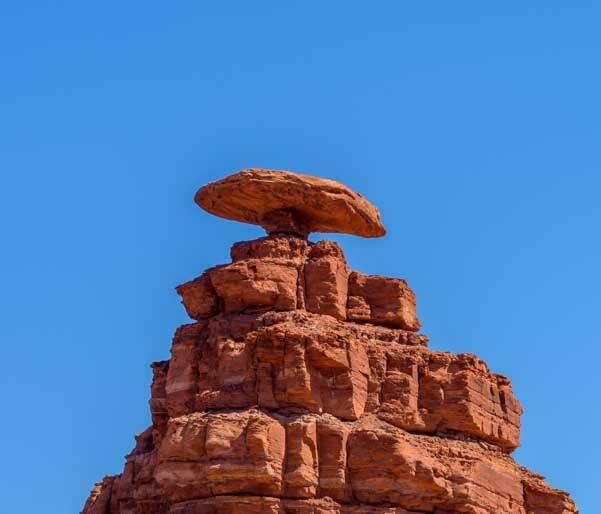 We were traveling through southeastern Utah with our RV, and before we arrived at this fantastic stone hat we found some wonderful patterns in the red rocks. 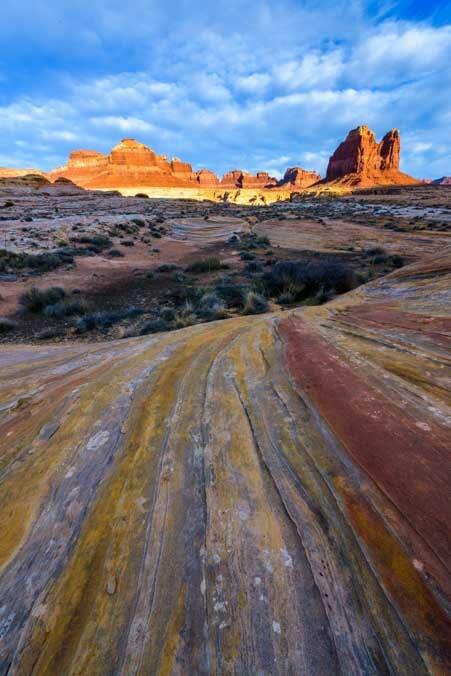 We spent a little time doing some wide angle photography, playing with the colorful lines in the sandstone. As the golden hour unfolded before sunset, I was astonished to look down at my feet and see a rainbow of colors! So much color right at my feet! The red, yellow, orange and gray stripes were beautiful, and we explored these unusual patterns at dusk and again at dawn. Buddy watched the sunrise with us. In some cases we focused our photos on the tiny patterns at our feet, but the size and scale of these immense rock landscapes was mind boggling. Huge landscapes dwarf Mark and Buddy on a rock outcropping. In many places the sandstone was solid underfoot, but in other places it gave way to patches of red beach sand and small dunes. 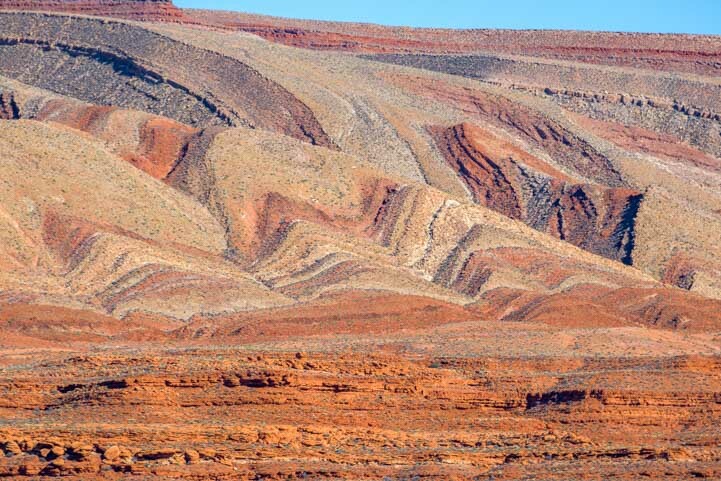 Ancient sand dunes turned to stone — lines and patterns everywhere. Buddy loved lying in the hot sand in the heat of the day and rubbing himself in its toasty warmth. He also got a kick out of chasing the lizards and birds that live in this exotic land. Of course, the bigger birds just stood their ground when they saw the excited puppy coming. One crow began to tease him, flying just out of reach and squawking. Buddy took the bait and tore after the crow, running and jumping as the bird swerved and dipped his wings near him. Suddenly Buddy took a big leap, eyes focused intently on the crow. He misjudged the uneven ground beneath him, lost his footing, and crashed into the sand chest first in a cloud of red dust. When he stood up and shook himself off he was wearing a pink bib and gloves! Buddy sports a peach bib and gloves after taking a flying leap after a bird and crash landing in the sand. 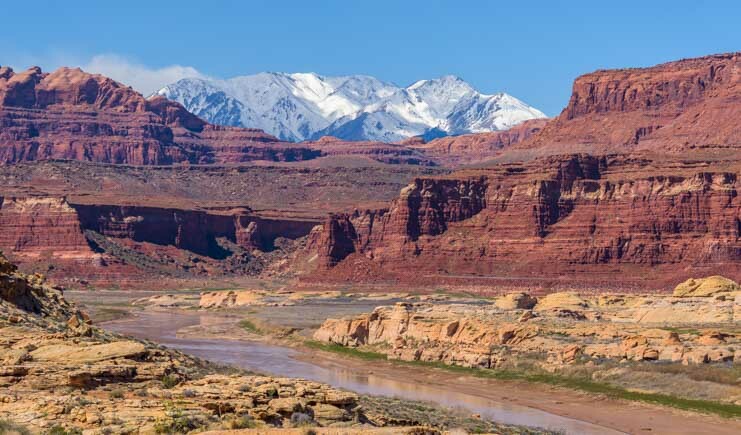 Rivers and waterways are responsible for the fantastic landscapes in this area, and when we drove over a bridge crossing the Colorado River we loved the contrast of the crimson cliffs and snowy mountains in the background. Snowy mountains and red rock cliffs. The landscapes were filled with color and vibrance. Vivid colors at the golden hour. 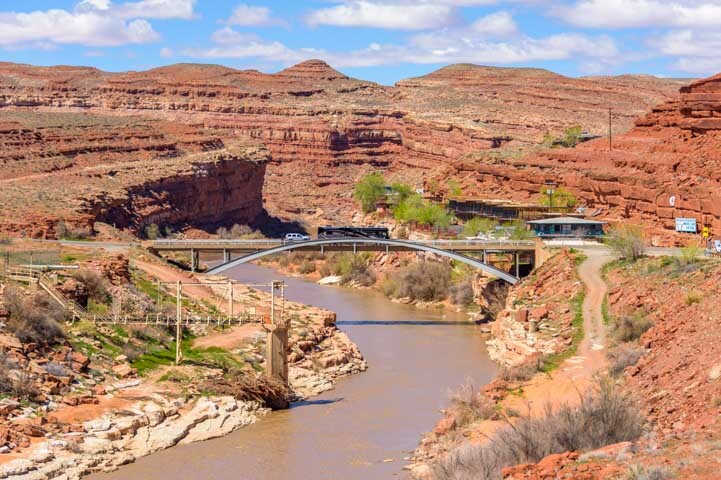 We crossed the San Juan River at the town of Mexican Hat. After driving over a hundred miles through vast empty landscapes, this village perched above the river was a fun surprise, and we got out to explore a bit. 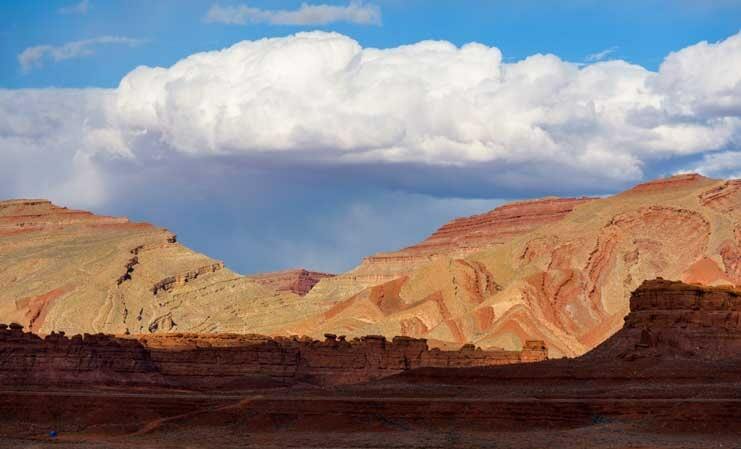 The village of Mexican Hat is perched along one side of the river. 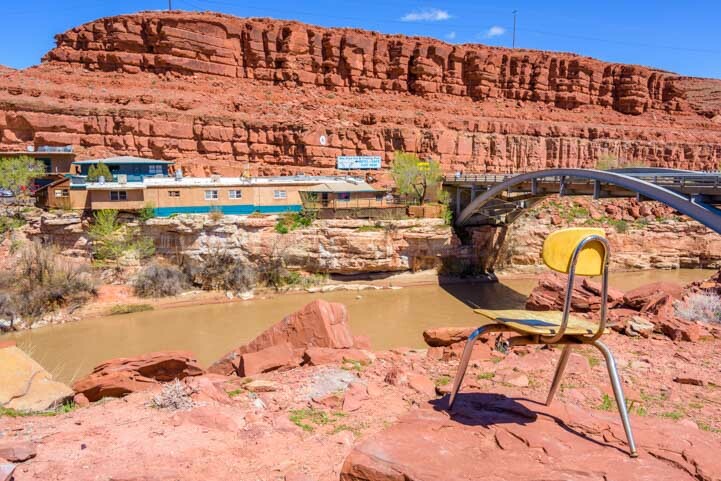 Someone had put a three-legged chair in a spot with a great view of the village on the opposite bank. You never know what you’ll find out here! Have a seat — but don’t fall over! We continued on and the skies clouded over. Storms brewed in the distance while the sun lit portions of the land here and there. What a magical place. 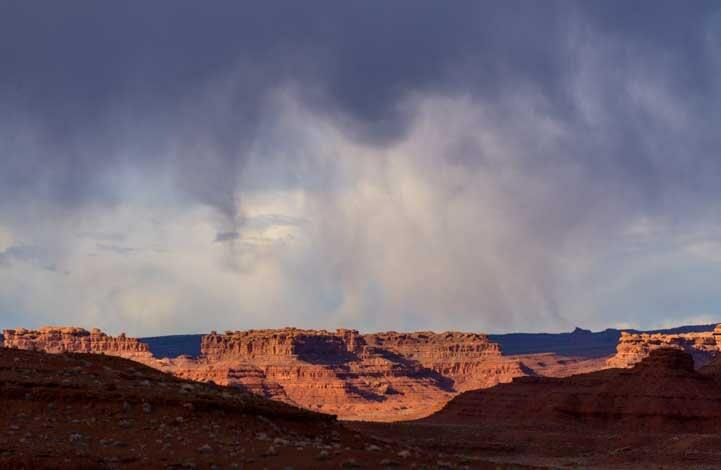 Storm clouds and rain drift across the red rock landscape. The rain never made it to us, but what a wonderfully brooding sky this was! 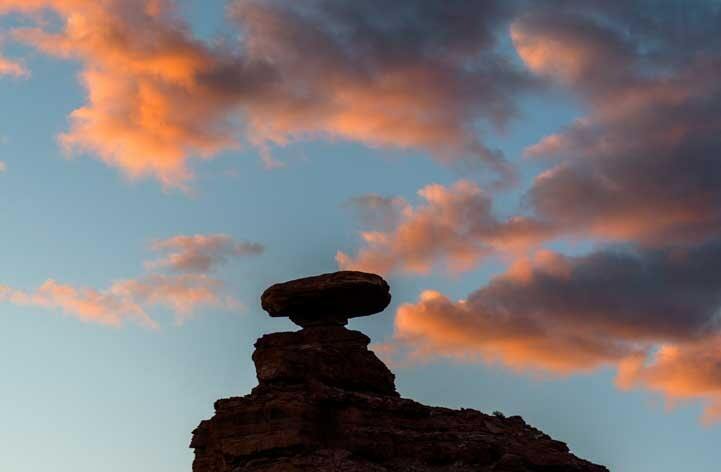 The village of Mexican Hat is named for the fun rock formation that looks like a Mexican sombrero. It was easy to spot and made us smile. What a perfect name for this formation and the village nearby! 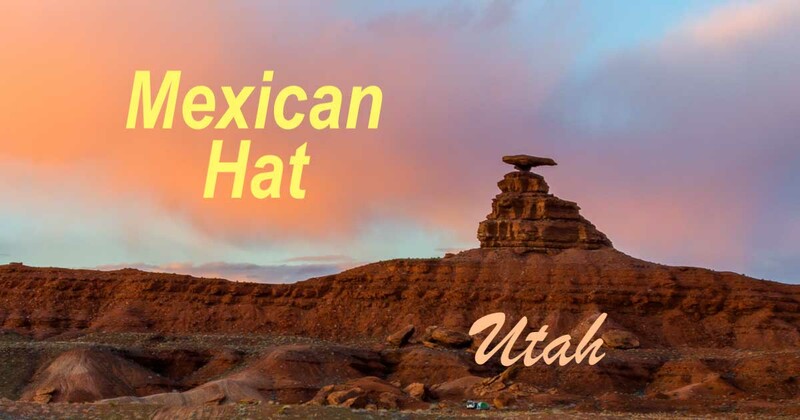 Mexican Hat is impossible to miss! Buddy decided to try it out and see how it fit. Buddy tries the hat on for size. Catching it from different angles and zooming in, the hat really dose look like a sombrero. It’s a true sombrero from this angle! It doesn’t look that big until you notice the hikers! As the afternoon wore on, the hat cast its shadow across the valley below. 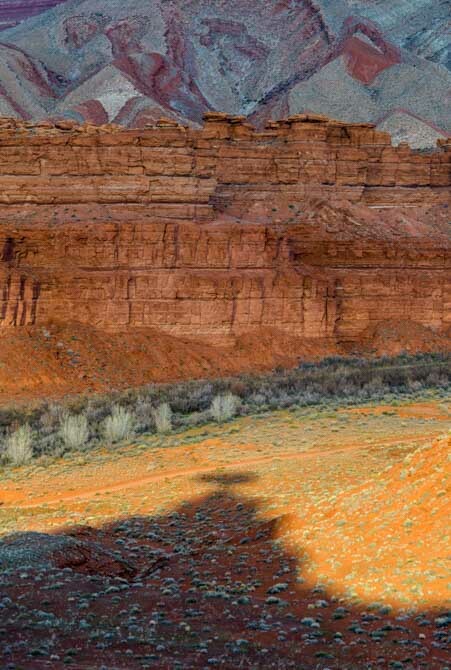 In the late afternoon Mexican Hat cast a shadow across the valley. And as the sun set it became a silhouette against the sky. And then it grew wings. 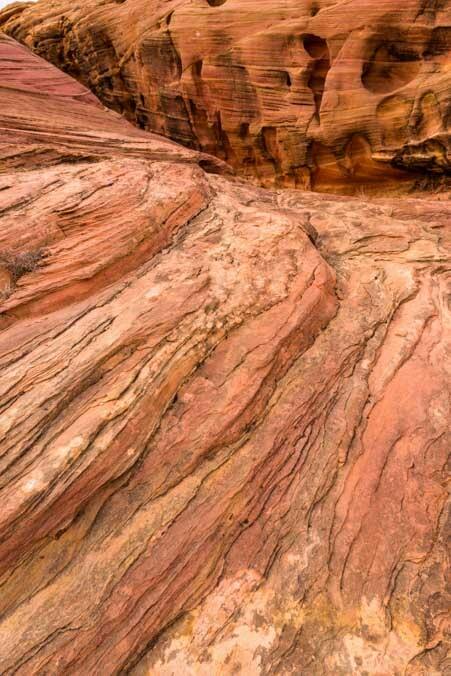 Continuing on, we saw incredible wavy patterns in the red rocks. We noticed vivid patterns in the distant hills. 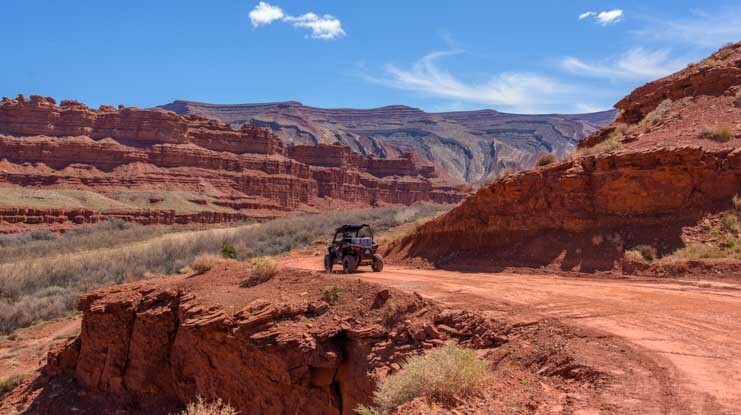 We hopped in the RZR to drive into the landscape a little further. We rounded a bend and found a couple taking a break from their Jeep ride to enjoy a quiet moment in their camp chairs with a fabulous view. We followed a jeep road into the landscape. A couple relaxes in their camp chairs in the middle of their Jeep ride! 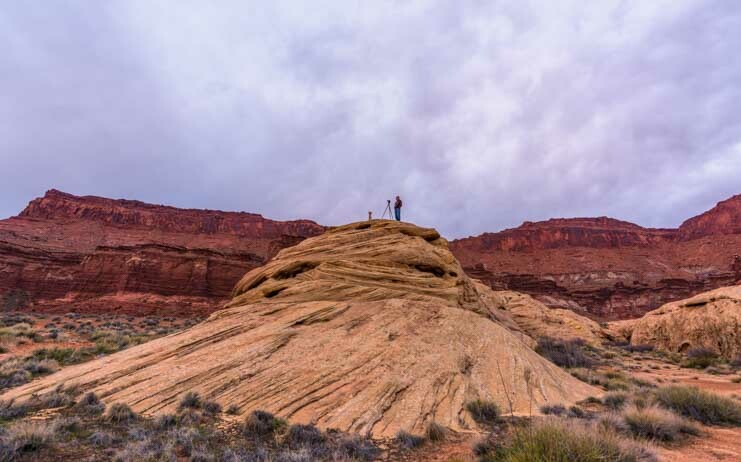 These landscapes just begged us to head off into the red rocks to take photos. Mark heads out to take some pics. We were drawn to the swirling patterns on the hillsides and couldn’t stop our cameras from clicking away. 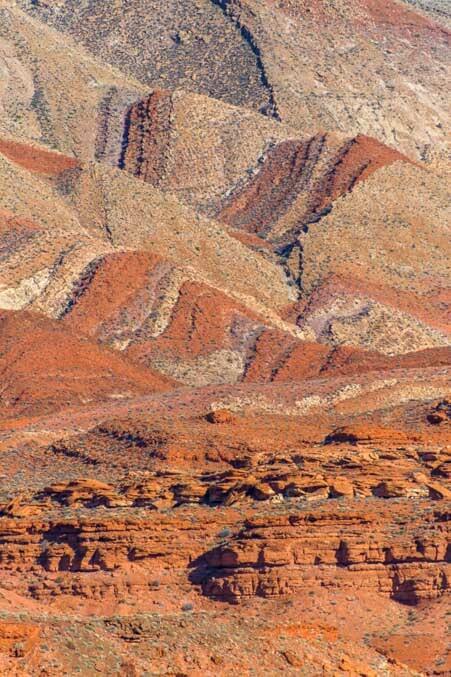 Triangular patterns swirled across the base of the mountains. Just how big are these wavy patterns? 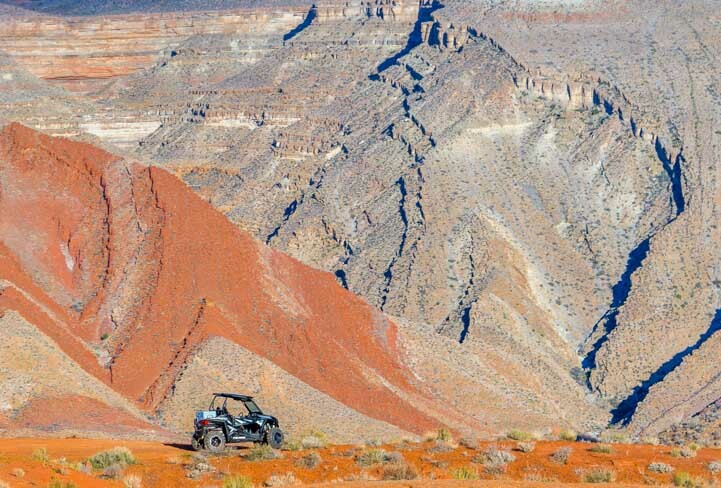 I had wandered around on foot exploring and then I looked up and noticed our RZR leaning up against this jaw-dropping landscape. Wow! How big are those patterns? Pretty big! With that in mind, here are a few more images taken as clouds rolled in overhead. Approaching clouds played with the light. We wanted to stay longer, but it was still quite cold in this part of Utah. Our fingers and toes were tired of being numb! 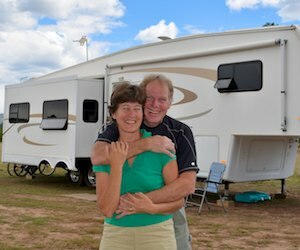 We had been in long pants and jackets for too long and we were ready to get back to central Arizona where the temps were hovering in the high 70s. Ahhhh….! What a great area. We’ll be back!! 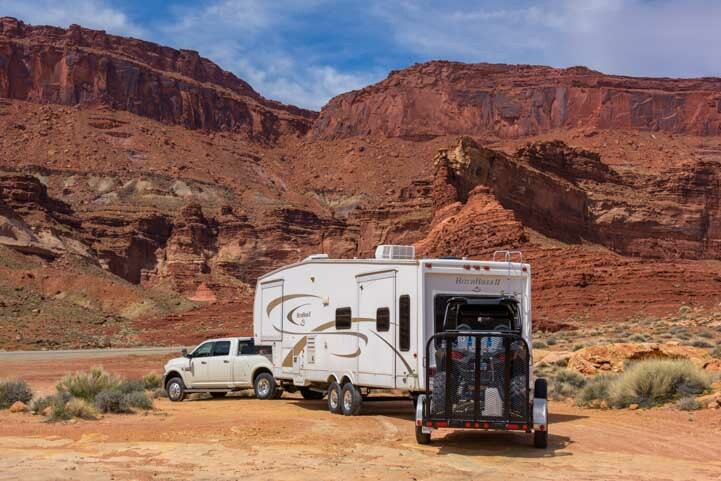 This entry was posted in Utah and tagged New, Red Rock Country, Travel, USA, Utah, Utah Southeast, Utah Southern by Roads Less Traveled. Bookmark the permalink. Beautiful pictures make me feel like I am right there! 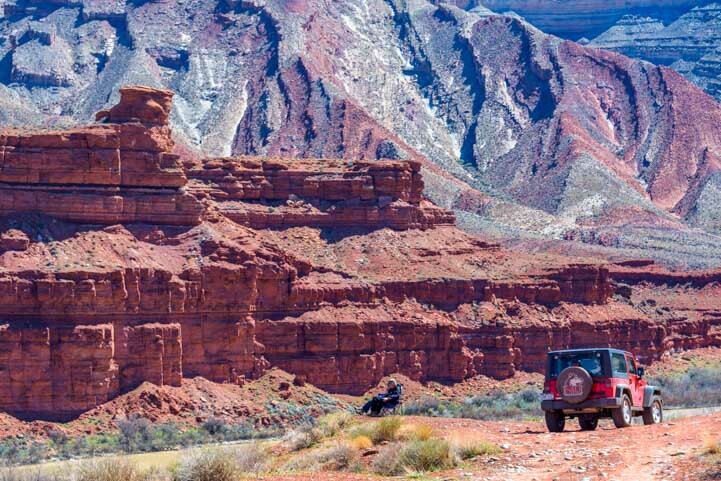 Love this area of Utah and it’s always a pleasure to experience it through your travels. That is quite a long rig you have there with your RZR on the back! Thank you, Liz. 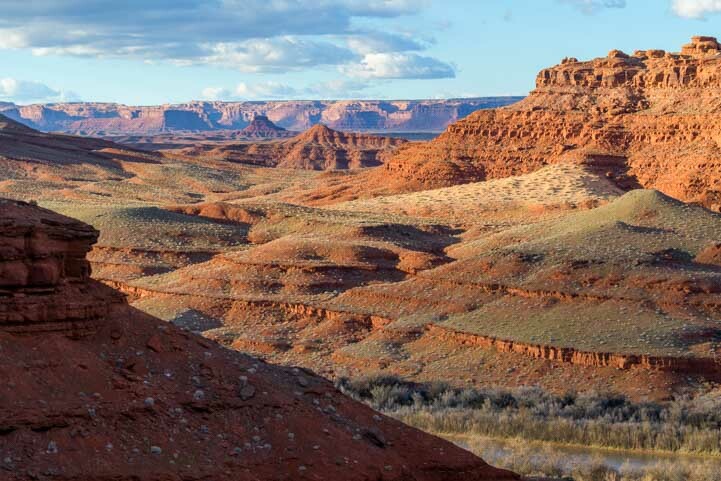 Southern Utah is absolutely exquisite, and we are always stunned by the beauty of the landscapes there. We’ll undoubtedly be back in a few months! We’re calling our rig The Train now, because it is insanely long. But the RZR is a total blast, and this is the easiest way to tote it around for now! Wonderful images. Thank you for sharing. 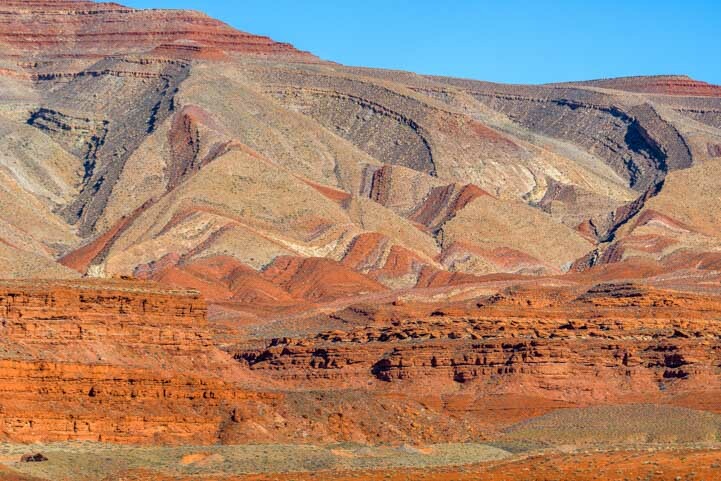 We liked the southern Utah area so much that after 10 years of fulltiming we purchased our home here and only travel part of the year, now. We have been here thirteen years, never gets boring. 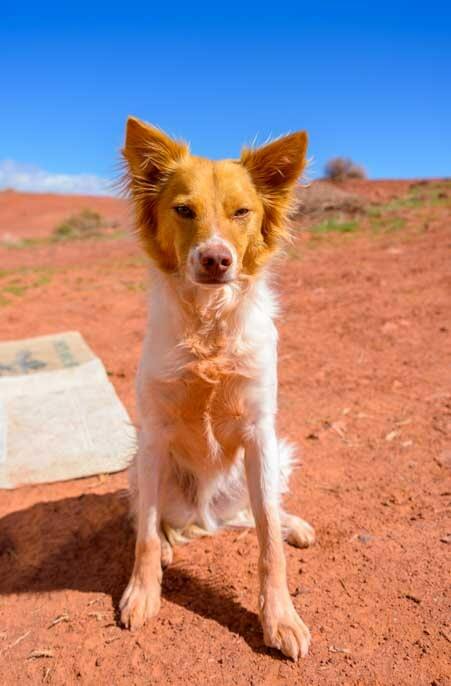 By the way, we call that look that Buddy is giving you the “Clint Squint” as in “make my day”. We have thought about doing exactly what you did, Mary. Maybe someday we’ll join you in that gorgeous part of the country and travel part-time. For now, though, our little Clint Squinter (love it!) gets a kick out of seeing new places and smelling new things all the time, so we’re on the go and exploring. Enjoy your piece of paradise!! It was so cute to see Buddy lying down on that berm with the hat behind him. I couldn’t help but line him up just so… Thanks for appreciating our pics, Bob!! You’re absolutely right, Annie, it is truly picturesque and so worthy of picture-taking and painting, too, for the lucky folks who have the talent!! 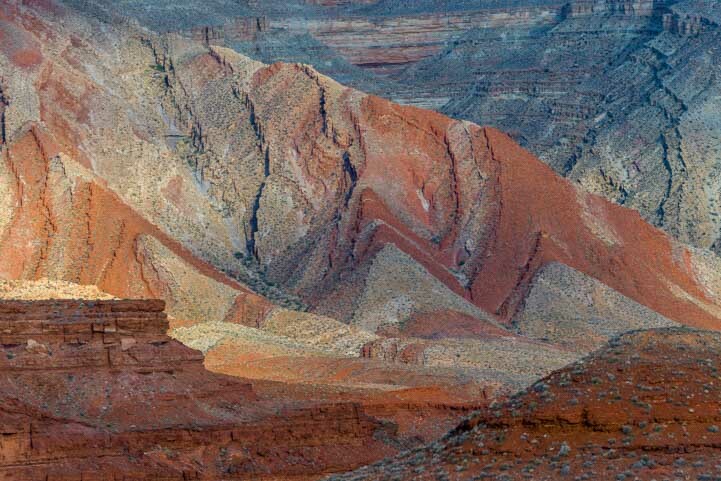 Your landscape pics in this post contain an incredible number of colors and textures – Wow! 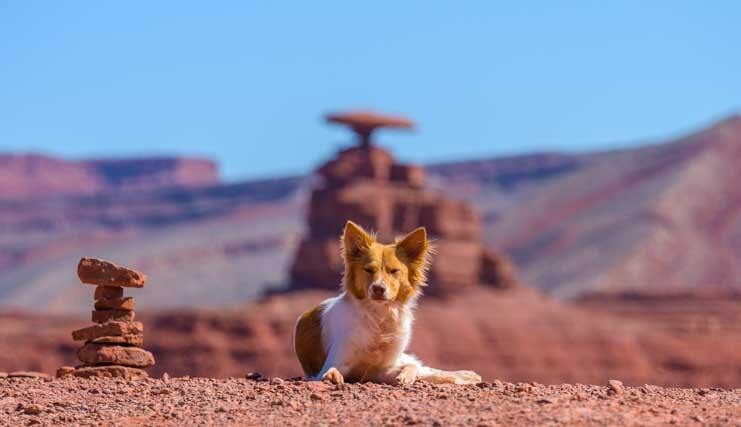 I like the long distance shot of Mark and Buddy, but I love Buddy’s Mexican Hat rock cairn! Somebody is pretty clever . . . There were two cairns on that berm, Mary, and I don’t know who put them there or why, but it sure was cute when Buddy posed next to the one and under the hat! The colors were amazing, however I have to say it took some hunting to find that array of lines with yellow and red. 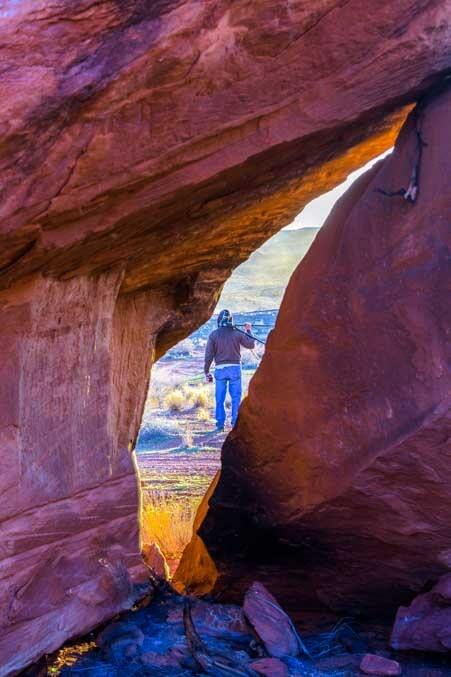 What luck that they pointed to the red rock formations in the distance! If it weren’t for the photography workshop I probably would have just glanced at those colorful lines and not really thought about their potential for a photo!! Beautiful pictures!! Buddy is so content wherever you take him – what a good pup!! 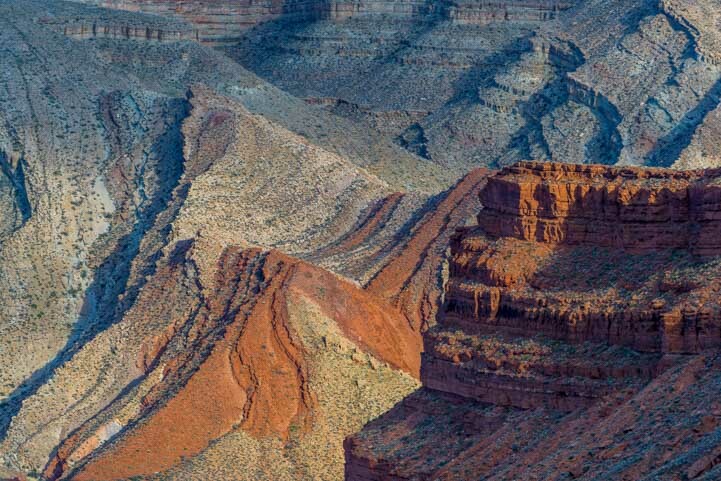 All of southern Utah is criss-crossed with unbelievably scenic roads and dramatic open landscapes. When you get to Utah you’ll be blown away by the beauty. You have some fabulous adventures ahead of you!! Thank you very much, LibertyFreedomPatriot (great handle!)! Please check your email and even your junk/spam folders for emails from me on March 23 and again on April 6. You can always email me directly: emilyfagan1 < at > gmail. Oh ! my – how the photo workshops have brought new perspective to your work….love, love, love !!!! Such natural beauty in this landscape…”lunar” in a sense ! And Buddy, clad in his colorful dust…with his “Clint-Squint”…. Thank you thank you!! We’re learning as we go and loving it. Buddy’s little pink bib is gone now but his face can hold a million expressions. So sweet! I am always shocked at the natural, raw beauty of the West….after I am there for a while, I long for green…..only to long for those fabulous colors when surrounded by green! I can’t make up my mind!! Your blog and photos are beautiful and awe-inspiring! Thank you! We’re with you, Susan. We love the red rocks and the beautiful vegetation of the Sonoran Desert, but there is nothing like getting into the snow capped mountains and alpine lakes for a while. But then we long for the saguaro cacti and red rocks again. That’s why we haven’t settled down anywhere!! Thank you for reading. So much color and beauty! Absolutely enjoyed your photography of the landscapes. 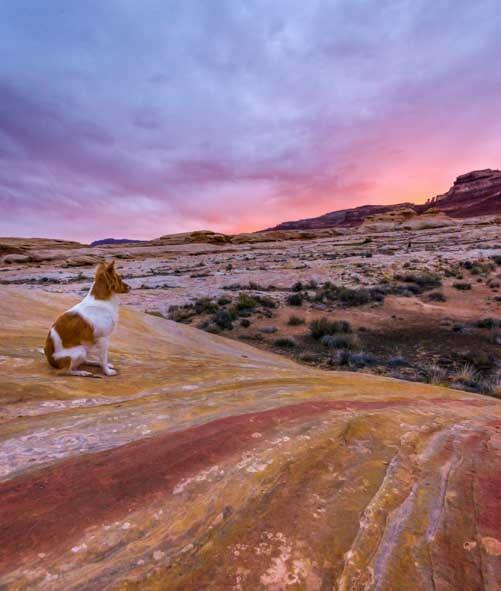 Pictures of Buddy are so fun – he seems to be an amazing little friend/traveler. I look forward to your next adventure. Thank you very much, JoAnn! Buddy is a really great little companion, and he’s super fun to photograph too, especially in beautiful places like this. We really appreciate your coming along with us on our adventures via the web. Thank you for your kind words!! So wonderful to hear from you, Tom! Thank you for the compliments!! We will be thinking of you when we visit Sedona in the next month or so.